Understanding rural transport statistics: Why are there so many new cars in county Roscommon? What happens when you see a data trend that defies easy explanation? This blog post focuses on an unusual statistic and asks the question, for which I don’t yet have an answer, “Why are there so many new cars in county Roscommon?”. More investigation is required and suggested explanations are welcome. When I have found the answer I will let you know. Read on if you are intrigued…. The Western Region (seven counties Donegal, Sligo, Leitrim, Mayo, Roscommon, Galway and Clare) does not align with NUTS 2 or 3 regions (or indeed with any other regional boundaries) so we are particularly interested in any data that is available at county level, and we like to keep track of what is available even if it is not of immediate use. We might glance at it and then, sometimes something jumps out that doesn’t fit in with our expectations. The number of new cars licensed for the first time in Roscommon is a good example of this. While the data itself is of limited interest to us, it can act as an indicator of consumption trends, of rural transport issues (new cars per head), and climate change influences (newer vehicles tend to be more energy efficient and have lower CO2 equivalent emissions) in each county. Looking at the data over time can draw attention to trends and show changes and highlight areas that need further investigation. To use the data we need to understand it, where it comes from, how it is collected and how these might influence what it shows, so the Roscommon anomaly is also of statistical interest. Data is published regularly by the CSO on vehicles licensed for the first time, and this is available at county level. Last week (14.01.16) the data on vehicles licensed in 2015 were released along with a map of new private cars licensed for the first time by county. Ten counties had more than 4,000 new cars licensed in 2015. Source: CSO, for an interactive version of the map visit here. It would be expected that counties with larger populations and wealthier counties will have higher more new private cars licensed, and for the most part they do. Just looking at the counties with the highest number of new private cars licensed for the first time in 2015 it is not surprising that Dublin (43,310), Cork (14,394), Kildare (5,253) and Galway (4,797) are at the top of the list. What is unexpected is that the next highest level of vehicle licensing is in county Roscommon (4,498). From the size of the population and the level of disposable income in the county, this would not have been expected. In the Western Region Roscommon has the second highest level of new vehicle registrations (after Galway) and although in population terms it is 6th of the seven Western Region counties. 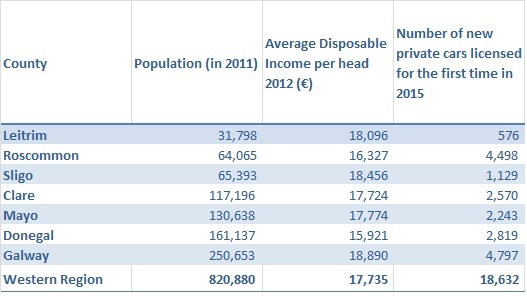 The table below shows the population of each of the Western Region counties (in 2011), average disposable income (2012) and the numbers of new private cars licensed in each county in 2015. Table 1: Population, disposable income and new private cars licensed for the first time. 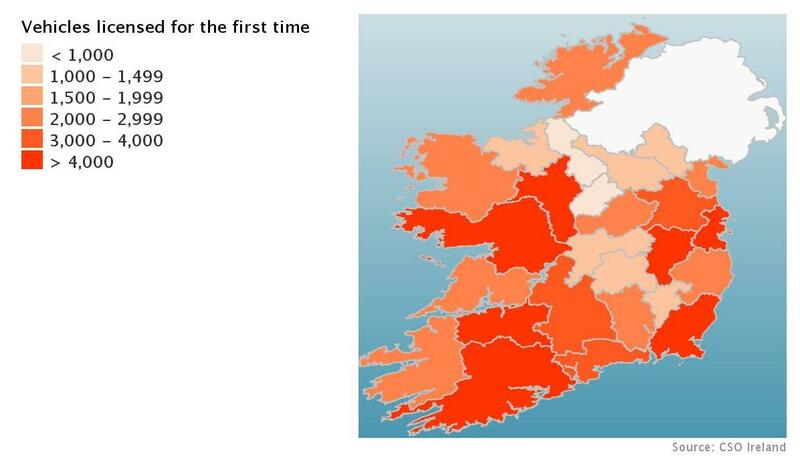 In Roscommon 0.070 new cars per head of population were licensed for the first time, in Galway it was 0.019. Growth in new vehicle licensing in Roscommon has been going on for some time. In 2006 some 3,533 vehicles were licensed for the first time in Roscommon, and the county had the 18th highest level of new vehicle licensing. However, while the number of private cars licensed for the first time in most counties dropped significantly after 2007, from 2009 growth rates in Roscommon were very different. 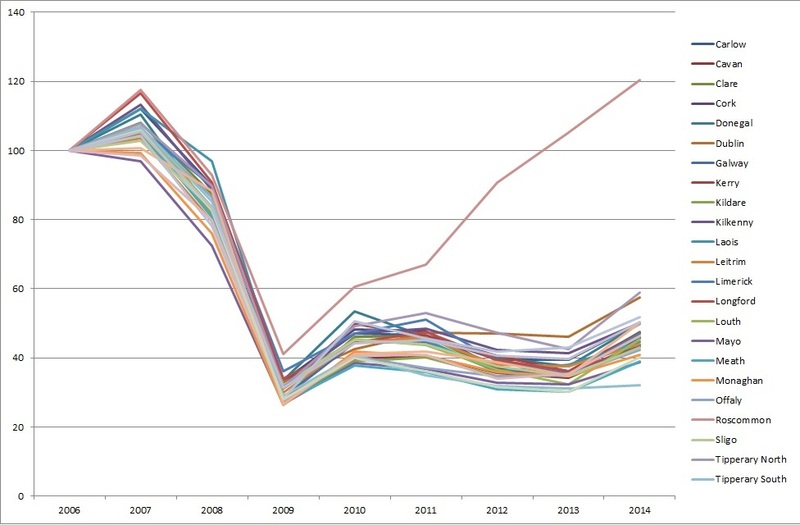 This is shown clearly in the chart below, which graphs an index of new vehicles licensed in each county, with the base year 2006=100. Most of the counties follow a similar trend while Roscommon stands out very clearly: after 2009 it followed a significantly different trend. Source data: CSO, New vehicles licensed for the first time by licensing authority . Index 2006= 100, own calculations. City and county Local Authority areas have been combined. So what might be the reason for this anomalous statistic? Much of the data referred to above relates to private cars so it is not likely to be associated the licensing of vans and other vehicles, nor with fleet purchases, though that detail is being investigated. If fleet purchases are recorded as private cars, it is possible that there are large fleet purchases happening in Roscommon which affect the statistics. I am awaiting clarification of this issue. It is likely that the high level of vehicle registrations in Roscommon could relate to a technicality in how people chose to licence vehicles and that the county data does not have a close relationship with the purchase of vehicles by a county’s residents. However, in order to licence a car for the first time, the licensee must have an address in that local authority area. The 2015 data referred to above is for new private cars and so does not reflect a trend towards a higher than usual level of purchases of second hand imports which are recorded as licensed for the first time. Perhaps Roscommon residents just have a fondness for new cars, despite their lower income levels. Or perhaps the longer distances driven by rural residents, the poorer quality of the road network and the lack of public transport may influence the need for people to buy new cars. But Roscommon does not have a monopoly on rural transport difficulties and if these were to provide the explanation other Western Region counties would be expected to have a similar level of vehicle registration per head of population. I am investigating the different possibilities and I’ll post again when I have found an answer, but this is a reminder not to take any statistic at face value without trying to understand what lies behind it. Vehicle licensing differs from registration in that a vehicle is licensed when a valid motor tax disc is issued for the first time. Registration occurs when a vehicle is issued with a license plate (registration number) for the first time. For the country as a whole there was a 31% increase in private cars vehicles licensed between 2014 (92,361) and 2015 (121,110) and a 70% increase since 2013. In 2015 private cars accounted for 78% of new vehicles licensed (82% in 2010). In Dublin the figure is 0.034 per head and Cork it was 0.028. Except Fig. 2 which is for all vehicles.